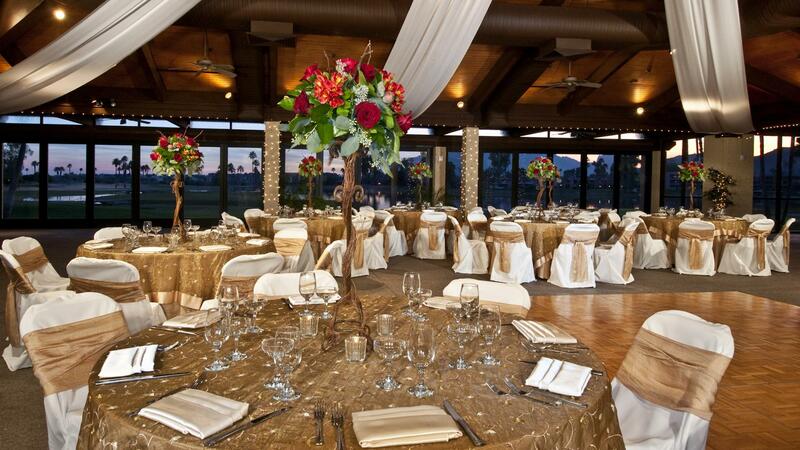 Rent McCormick Ranch Golf Club | Corporate Events | Wedding Locations, Event Spaces and Party Venues. Recently voted “Best Golf Course Wedding Venue” by the Wedding Chronicle’s Readers Poll, we’re certain you’ll find exceptional value in our pricing when compared to other Scottsdale area golf clubs and resorts. Our food selections paired with a four-hour bar package begin at $64 per person. Pricing includes an hors d’oeuvre welcome reception prior to dinner, champagne service for toasts and full wine service throughout dinner. McCormick Ranch Golf Club, located in the heart of Scottsdale with majestic views of Camelback Mountain, is the perfect place to host your wedding ceremony and reception. Our 6,600 square foot Outdoor Pavilion (also can be enclosed as needed with bi-folding glass doors and air/heat) has the best scenery in town and can accommodate up to 400 guests. Our coveted West Lawn Pavilion is downright palatial, featuring floor to ceiling accordion, glass doors. The emerald lawn sets the stage for our wedding ceremonies with Camelback Mountain and McCormick Lake serving as the backdrop. At 6,600 square feet, this versatile indoor and outdoor venue is perfect for events between 100 to 400 people, year round. Our Ceremony site is located on the grassy shores of Scottsdale's largest lake. Peering out over the sparkling water, your eyes will eventually meet an immaculate view of Camelback Mountain in its entirety. The dramatic landscape of emerald greens, blue sky, and glistening water is the perfect backdrop to share with the most important people you love on your special day. We pride ourselves on providing a phenomenal value to our wedding parties here in beautiful Scottsdale, Arizona. The Clubhouse McCormick Ranch is the ideal location for banquets, weddings and holiday parties of 50-100 people. In 2012 our Clubhouse & Lakeview Room were renovated, and our stone-tile fireplace will make you feel right at home. Our popular Palm Terrace and Patio are seasonally available for parties, and you'll breathe easy in this outdoor, serene setting.